As the soccer world goes bonkers over rumours and speculation while the European Transfer Deadline goes down to the wire, I’m sure I’m not alone among Red Bulls supporters as I reflect upon the current state of our squad and the transfers that have played their part in turning a season of promise to one of frustration and dismay. Having started off the season as critical favorites to claim MLS Cup, we’re now odds-on favorites to miss the playoffs. Given the league’s bloated playoff scheme, that’s saying a lot. Popular as it has been to pile on Backe, a glance at our personnel moves over the past year points the blame elsewhere, at those truly responsible for stocking the squad. Hurricane Irene deferred the inevitable comparisons with the star-laden Galaxy, one disaster quite likely postponing another. But when we consider the attendance pull from the likes of Beckham, Donovan and Keane, the comments coming from GM Erik Soler this week that he hopes to retain the services of Frank Rost, seem all the more perplexing. The Designated Player slot isn’t simply performance based. The DP must also serve a marketing function. Despite Soler’s claims, there seems to be little or no interest from European clubs to have Rost defend their goal. And if ever there was a case of a signing contributing in terms of performance or marketing, surely our third DP is exemplary. Given the wealth of domestic talent at the position, why did/do we need an aging (injured) German keeper most fans couldn’t care less about? The lack of a creative midfielder remains our most obvious weakness. The acquisition of Mehdi Ballouchy, fifty weeks ago, is arguably the single most destructive trade in our club’s dubious transfer history. The sense that Matt Kandji might have hit his peak didn’t keep him from setting up the MLS Cup winning goal for the Rapids. Buyer’s remorse! Since Real Salt Lake won the Cup after they traded Ballouchy to Colorado, one wonders if there’s power in threes and that sending him on to another club might just be the lucky spark we need to turn this season around. Watching DeRosario thrive with the Scum has made it all the more difficult to have any faith in our GM. Dax McCarty has shown fight but one can’t help but predict a bright future looms for Austin DaLuz. All the preseason talk of the Red Bulls playing an open and free-flowing style of attacking football seems ages ago. Backe had expressed concern that we might be too indirect, and that we shouldn’t keep possession for possession’s sake. Now, we’re reduced to attacks down the flanks, as opposition dominate the center of the pitch match-after-match. Irene and the Interlull have given us all a bit of a reprieve. But the concerns remain. We have the league’s best finisher in Thierry Henry. He came to us. Soler can’t take credit for that perfect DP signing. But he must take the blame for our lack of a playmaking presence in midfield. Until we have someone to deliver the final ball, Henry’s ability won’t be used to its full potential. That we’d contemplate relying on teaching old dogs new tricks and converting Henry or Marquez into midfield playmaker roles merely reveals the depths of our desperation. Rather than turning up the heat on Hans, we need to realize without a creative midfielder, we can’t begin to play Backe-ball. 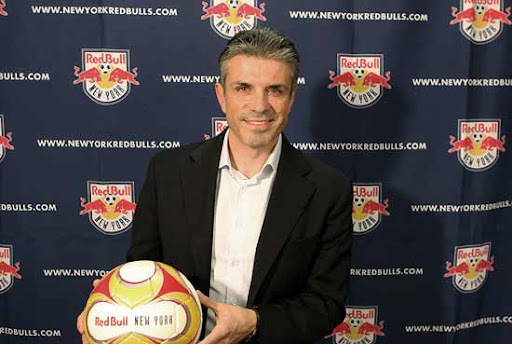 Whether or not current management has the ability and ambition to address our need for a playmaker is the lingering question that makes transfer speculation a depressing diversion for New York soccer fans. If he fails to address this urgent need, soon we should be saying so long to Soler. Someone should be going before our season is gone.